Home » Digital Games and Learning » X-boxes in the Classroom, Really? Todays blog continues the Digital Games and Kids series with a story of using popular X-box games in the classroom. This short video is a great exerpt from Good Games Spawn Point , the Australian Broadcasting Corporations’s kids show that reviews new games out. 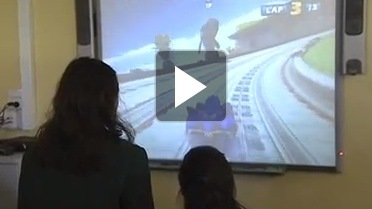 This segment features an interview with Head Science Teacher Alice Leung, who uses X-box games in the classroom. She uses games like Formula 1, Sonic and Sega All Stars as tools to assist with learning Maths, Logic and Teamwork. Xbox educational using popular games? Alice Leung, the teacher explains that the games are good for teaching new concepts. ‘With games, the kids are less fearful’ …’less shy’, ‘it’s OK to have a go’, and its ‘ok to fail playing a game’. To me that’s an enormous barrier to overcome with learning – kids accepting themselves that they can take a risk and try something out – and its ok to make a mess of it. It also fits perfectly with an inquiry approach to learning. ‘We see kids really having fun and learning’. Alice says. Other teachers in the school are trying it out also. Apparently the history teachers are experimenting with Age of Empires (my husband’s favourite game). What I found really interesting is the creative ways Alice uses the games. The main example in the video is using racing games like Formula 1 and Sonic, to test out whether talking on a mobile phone (cell phone) while driving, impairs the ability to drive. Just a brilliant use of a game. With approaches like that to the use of gaming in the classroom, it seems there can be endless benefits (and not a piece of broccoli) or hint of the game being ‘educational’ in sight. I wonder how these types of uses of gaming fit into the research? I’d really like to hear of any other examples of using games for learning in this type of fashion – either in the classroom, or with home schooling. Yesterday’s blog, ‘Is it game over, Princess?‘ looked at some of the research on gaming and whether there are educational benefits.